Finally free - Escape from civilization - freed from all constraints. The mountain world, which is so hostile to life in the first place, immediately conveys a feeling of security and immediately becomes a place of longing for the beholder. The floating ceiling gives the place something mystical, there the little church, spirituality awakens - the so unapproachable place becomes the source of deeper knowledge for those who reach it. Shoes that no one owns, footprints in the snow - departure to another life. Word, World, Way... is an interactive installation. 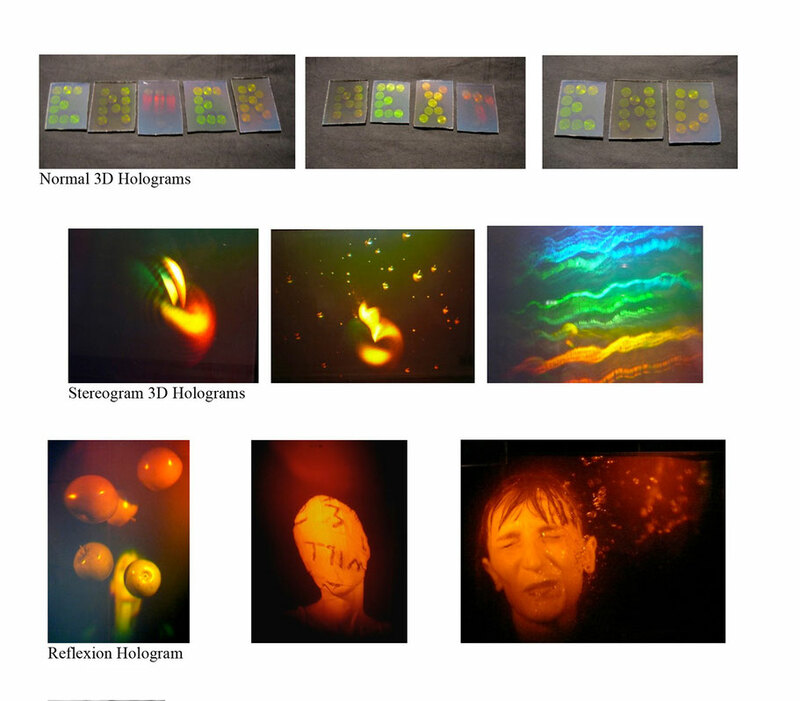 It is composed of three Holograms (Stereogram 3D), three Holograms (Normal 3D) three Holograms (Reflexsion). The interactive installation "Word, World, Way.... “ is presenting a connection between three synonyms with which we used to present our thoughts, our moving, our world. The Word is transferring our thoughts. It is a reproduction and presentation of our mindset. It transfers our inner World. With words we are depicting the “outside World” our inner universe. And Word, World, Way is interacting and affecting each other. It moves us in real and virtual World. SALTY DROPS The installation consists of 70 glass balls falling freely floorwards from the ceiling and a video projection. The glass balls are filled with red fluorescent liquid with different fullness and density, which gives an ambiance of light and fluid. 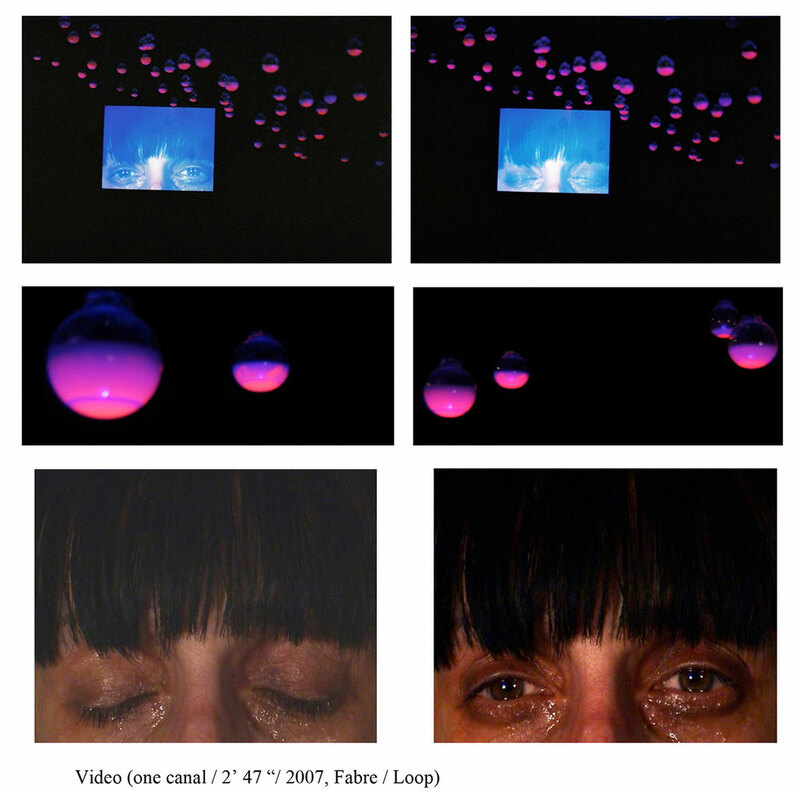 In the background, a video of tears falling down the artist's face is running. 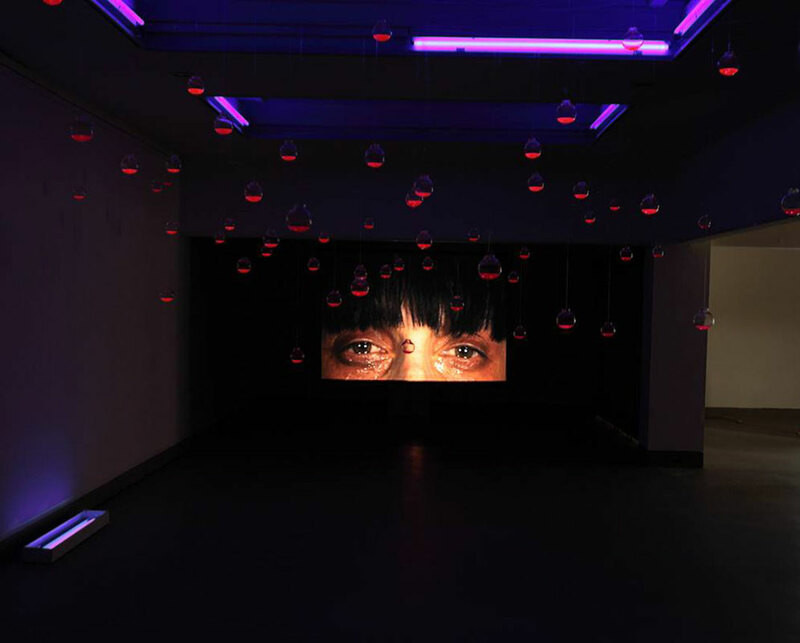 The video is specially toned with a sound of drops following the tears. The installation is set in a completely dark room where the glass balls are filled with fluorescent light with special illumination. In old antic times when women where waiting for there husbands during long combats and wars they collected there very own tears in ceramic jugs in order to provide the agonising sadness and pain to there returning husbands. Tears are drops which are a part of our being, and they are my first inspiration on water and liquid. They come as a product of our emotions whether sad or joyful. EVERYDAY LIFE / ALLTAG The Project ist composed of 8 matrix hollograms (dimension 9x9 cm) and 4 video projections with footage from the film "Groundhog day" from Harold Ramis. These all are the daily movements of modern people which are, most frequently, encircled within a week's cycle. In brief, the everyday life means getting used to and adapting oneself to one's own stereotyped feelings, thoughts and relations. Every habit we may have acquired from our proper instinct, from our upbringing in the family or from our school training is becoming an automatism. This makes me wonder about our ability to change the everyday life. 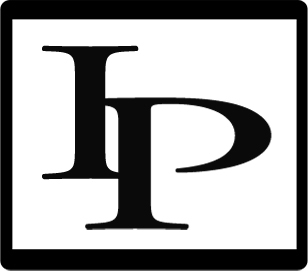 To what extent an Individuum is able to tansform potentials that are transmitted by genes or acquired during the lifetime to good use, and what is the chance of cultivating those potentials? How much are we enclosed and limited by the Everyday life?